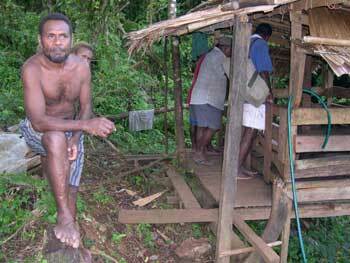 The Sustainable Youth Livelihoods Project was developed following the conflict of 2000-2002 in the Solomons. The Sustainable Livelihoods for Rural Youth Project is designed to create opportunities and livelihoods based on agriculture. Two years from April 2002. AusAID (Australian Agency for International Development – a unit of the Australian Department of Foreign Affairs). Kastom Gaden Association, Solomon Islands; Tony Jansen (TerraCircle). meet basic needs for livelihood and food security in rural communities. train participants in skills and models that suit village and social structures. the arrival of RAMSI (the Regional Assistance Mission Solomon Islands – the Pacific nations police and military intervention to restore peace and stability to the Solomons, led by Australia) has had no direct impact on the project other than contributing to a general feeling of optimism for the future in rural and town areas; the KGA monitoring team was working in villages in North Malaita without any problems prior to the arrival of the RAMSI force in Malaita. a new system is being implemented in which young farmers who achieve certain milestones in their microenterprises obtain tools at a subsidised rate between 50 to 70 per cent; this approach is based on rewarding achievement rather than reinforcing the hand-out mentality perpetuated by many external aid programmes. the use of animal manure on the farms of participating youths is a more sustainable method of improving soil fertility than the use of synthetic fertilisers or traditional burning practices. in most cases where youths have left the village, family groups continue the small farming business, often with another young person in the family assuming responsibility. the project manager and project director attended a workshop in Australia with Oxfam Community Aid Abroad in the use of the ‘Most Significant Change’ monitoring method; the approach may be trialed in the last quarter of the youth livelihoods project to provide insight into wider, non-quantitative impacts of the project. a training-of-trainers course was run in November, funded by European Union Micro Projects. TerraCircle Association provided a journalist in December 2003 to visit the Solomon Islands to collect information for trainee handbooks on agroforestry and pig farming; publication will be early 2004.